Blasphemous paintings of Shri Hanuman by MF Hussain! Defamation of Shri Hanuman by anti-Hindus! Be a Rambhakta, Save Hindu Dharma! 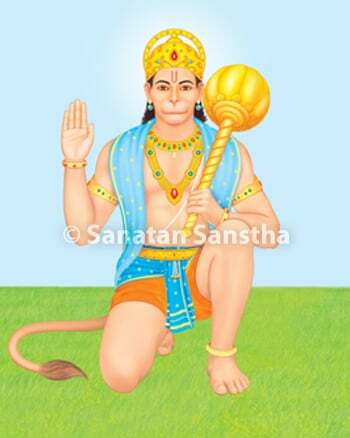 Hanuman Jayanti is celebrated on the full moon day (pournima) of the Hindu lunar month of Chaitra. 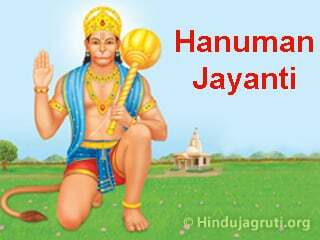 A special feature of Hanuman Jayanti is that according to some religious almanacs (panchangs) the birthday of Shri Hanuman falls on the fourteenth day (chaturdashi) in the dark fortnight of the month of Ashvin while according to others it falls on the full moon day in the bright fortnight of Chaitra. On this day, in a Hanuman temple spiritual discourses are started at dawn. Hanuman was born at sunrise. 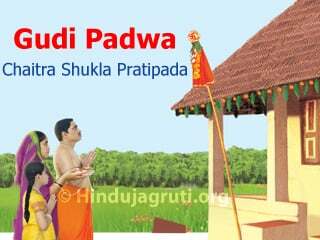 At that time the spiritual discourse is stopped and the offering of food (Prasad) is distributed to everyone. To provide assistance for the establishment of the Divine Kingdom : The main objective of Shri Hanuman’s life was to destroy obstacles in the establishment of the Divine Kingdom by providing the required warrior element. As a result, the embodied souls who would assist in the establishment of the Divine Kingdom were protected. For this reason itself Shri Hanuman manifests Himself in various forms during different Yugas. His task in the manifest-unmanifest form never ceases. Shri Hanuman has humility in serving (i.e. Dasyabhav) to the extent of 100%. Thus He is constantly active. Assisting embodied souls in performing spiritual practice : Shri Hanuman has always helped embodied souls do spiritual practice in various Yugas. 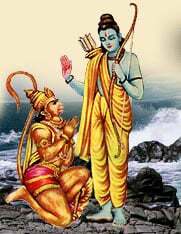 In the Tretayuga Shri Hanuman taught the right path of spiritual practice to the monkeys and helped them. Liberating many souls : The embodied souls with an intense desire for spiritual practice were granted liberation by Shri Hanuman even at the cost of His own powers. He liberated many souls from existence in their cursed class by using His mace. An example of a perfect Sevak : Shri Hanuman presented an example of a perfect sevak. As a result, many embodied souls attained Final Liberation by following the same path i.e. Dasyatva. 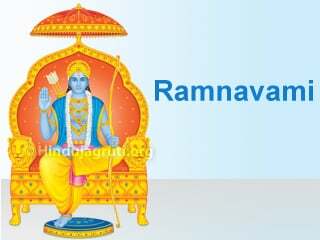 Due to His humility only He was able to narrate the good qualities of Shri Rama to Ravan and when Ravan denigrated Shri Rama, Hanuman burnt Lanka and returned safely. 1. Ritualistic worship of Shri Hanuman (Maruti) There is a specific science to the ritualistic worship of each Deity. This means that, actions done in a particular way during the ritualistic worship, have a specific underlying science. 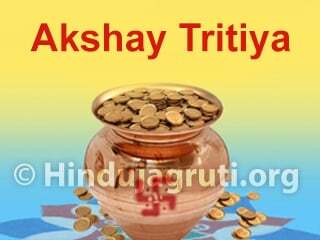 Just by following these actions, we can get maximum benefit of that Deity’s Principle. The following questions and answers contains the divine knowledge received by the seekers regarding exactly how some routine actions should be performed during the ritualistic worship of Shri Hanuman (Maruti). Q. – How should a worshipper apply sindoor before starting the ritualistic worship of Shri Hanuman ? Ans. – Sindoor should be applied with the ring finger. Q. – Which flowers should be offered? In what number? What is the method of offering the flowers ? Ans. – Flowers and leaves of calotropis (ruee) Five or multiples of five. 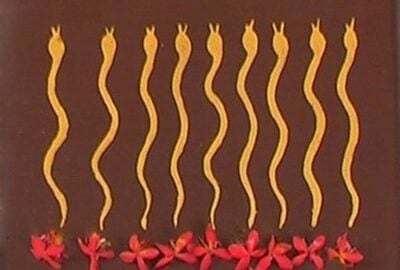 The stems of flowers should be turned towards the Deity. Q. – Incense sticks of which fragrances should be used? How many incense sticks should be used ? What is the method of waving ? Ans. – Kewda, Chameli (Jasmine) and Ambar. Two incense sticks. Holding them between the index finger and thumb of the right hand, the incense sticks should be waved thrice, in a clockwise direction, in a full circle. Q. – How many circumambulations should be performed around Shri Hanuman ? Ans. – Minimum five but if a worshipper wants to perform more, then they should be in multiples of five. In Maharashtra, Saturday is considered to be the day of Shri Hanuman while in rest of India (Bhaarat) both Tuesday and Wednesday are considered to be His days. There is a custom of offering sindoor and oil to Shri Hanuman on these days. Breaking a coconut in front of Shri Hanuman also appears to be an age old custom. For spiritual progress, Shri Hanuman with His face to the left (Vaammukhi Hanuman) or Shri Hanuman with an attitude of service (Daas Hanuman) is worshipped. Oil is taken in a bowl and 14 black urad grains are put in it. Thereafter one sees the reflection of his face in the oil. The oil is then offered to Shri Hanuman. 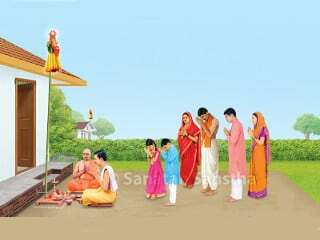 The method of worship remains the same even when a person is sick and cannot visit a temple. The reflection of negative energy also takes place along with the reflection of ones face. When such oil is offered to Shri Hanuman, the negative energy therein gets destroyed. A true oil-merchant does not sell oil on Saturday because the negative energy causing distress to a person, who is going to offer the oil to Shri Hanuman, is likely to attack the oil merchant. Therefore one should not buy oil from the vendors sitting outside the Shri Hanuman temple but should bring it from his own house instead. The sacred thread (Janeu) on Hanuman’s left shoulder is a sign of Brahmatej. Since Shri Hanuman is an incarnation of Shri Shiva He has destructive powers too. Yet, because of His devotion to Shri Rama, Vishnu-tatva developed in Him. Since Shri Hanuman adorns Brahmatej and Kshatratej during wars, He can use both as required. During the war between the Kauravas and Pandavas, Shri Krishna seated Shri Hanuman on Arjun’s chariot (He can be seen on the flag at the top of Arjun’s chariot). 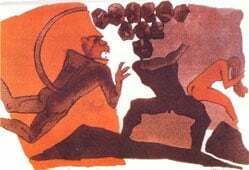 Hanuman destroyed the weapons, directed at Arjun and his chariot, in mid-air itself. To get the benefit of the gross, manifest and destroyer element, we should avoid installing an idol of Shri Hanuman in the seated posture. Amongst the seven higher Deities (Shiva, Ganapati, Rama, Krishna, Datta, Maruti and Durga), Shri Hanuman’s element (tatva) is of a gross, manifest and destroyer nature. The word ‘Hanuman’ means – ‘One whose ‘roar’ cannot be fathomed even by the Gods’. When Gods perform a destructive activity, they use the ‘Maruti’ element (which moves at the speed of wind) as a medium to appear in the Universe. Hence He is referred to as Shri Hanuman. The roar of Shri Hanuman is capable of activating the element of any higher Deity in the Universe who is engrossed in deep meditation. Similarly, it also possesses the power to shake all the fourteen planes (Saptalok and Saptapatal). Shri Hanuman in seated posture depicts the unmanifest form of power. Shri Hanuman in a warrior posture depicts the manifest form of power. To obtain the benefit of the gross, manifest and destroyer element, we should avoid installing a seated idol of Shri Hanuman in a temple. Shri Hanuman in a seated position implies He is in deep meditation, wherein His motor organs are in a dormant, inactive state. Thus, the common man will be able to derive very little benefit from this posture of Shri Hanuman. When the spiritual level of an embodied soul is above 60%, it is capable of activating the element present in an idol in meditation, through his devotion. Blasphemous paintings of Shri Hanuman by MF Hussain ! 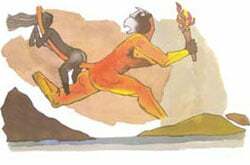 The modern Ghazhani MF Hussain has painted Shri Hanuman in very blasphemous form along with Sree Sita and Shri Ram. Following are some paintings by Hussain. Shri Hanuman is a symbol of devotion and Divine power. Hindus worshipping Shri Hanuman should take note of his strength and wake up to destroy these despicable modern forms of Rawan, then it will be the true worship of Hanumanji. The defamation of Shri Hanuman and the Ramayana is going on through the various medias and anti-Hindus. Here are a few examples of it. ‘Makemytrip’, an Indian travel company, had launched a flash presentation advertising a trip to Sri Lanka and had depicted Sree Rama, Lakshmana and Hanuman in a disrespectful way. SBI denigrates the Ramayana and Shri Hanuman through their advertisements. It was later removed from their website and they apologized after HJS protested against it. 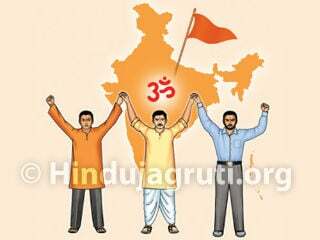 Become a Rambhakta and save Hindu Dharma ! 1. 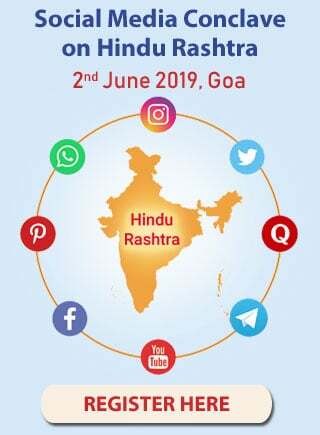 Protest against any defamation of Hindu Dharma and make efforts to punish the guilty. 2. Start spiritual practice by which you will get the blessings of Deities and your mission will succeed.